From 'Band Union' to bandoneón? What is the origin of the word bandoneón? Two competing theories exist. They both agree that the instrument is somehow named after the assumed inventor, Heinrich Band. The name ‘Band Union’ was used by Heinrich Band and partners, and it got mispronounced and reinterpreted in Argentina as bandoneón. The name was invented by Band or others based on the naming of other instruments such as the accordion, Band + ion was transformed into bandonion, which in turn became bandoneón in Argentina. In the discussion following Ms Hedgehog’s good introduction to the bandoneón, the validity of theory one was questioned, but the German Wikipedia didn’t really occur to me as an authoritative source on the subject. Alas, time for a little research. Would it be possible to find early sources referring to this ’Band Union’ or Heinrich Band and the naming of his instrument? An even earlier source of the same is mentioned by Ramon Pelinski in Latin American Music Review / Revista de Música Latinoamericana that the name of the instrument was “Bandonion”. As there is some evidence that Band himself named the instrument bandonion, that strenghtens theory 2 considerably. So where did the Band Union theory come from, and why is it so widespread? A search on books.google.com suggests an answer. It appears this theory is mentioned in several works on the history of tango. Unfortunately, Google books only gives a snippet view of these books, but in some snippets the historian Zucchi is mentioned, and in others the dictionary Enciclopedia universal ilustrada europeo-americana. He also writes that Román does not believe that Band himself created the bandoneón, rather that it was Carl Zim(m)erman, concluding from said advertisment that Band was neither the inventor of the intstrument, nor the name, although somewhat contradictory he also dismisses the Band Union theory based on there being no records of this company in Krefeld. This information seems to be confirmed by the this website, giving a Joh. Schmitz, Krefeld as the source. If that is correct, it shows that the name was established before the instrument arrived in Argentina some time around 1863-1884. Which leaves us with the Spanish encyclopedia as the primary suspect for the Band Union theory. 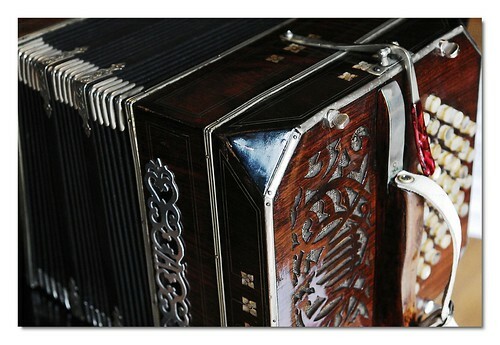 The bandoneón was based on the concertina, invented by Uhlig of Chemniz around 1830. The concertina was refined into the bandoneón, probably by Zimmermann, not Band. Heinrich Band was an instrument trader, and the instrument is named after him. The name bandonion was established in Germany, and the name bandoneón is the Spanish version of this, not Band Union. If you have access to e.g Acuerdos acercaa del idioma (1947, p. 144) or Boletín de la Academia Argentina de de Letras (1978, p. 303) – search books.google.com for “Heinrich Band” and “bandoneon” to find more. – verify that the Spanish Encyclopedia mentioned above is cited as the source for the Band Union story. Der Bandonionverein Carlsfeld mentions Band Union in their Beginn der Musikinstrumentenproduktion in Carlsfeld “Vermutlich hat der Musikalienhändler Heinrich Band aus Krefeld diesen Instrumenten den Namen Bandonion -aus Accord ion = Band Union -gegeben).” Which I can’t really make much sense of. Anyone? If you are in NYC, you migh want to check out the Accordionmuseum On their website, they say they have: “Band Union: Third model of the first prototype before they were called Bandoneon. Hand made in Germany in the year 1890” I was thinking maybe it said Band Union on some early instruments, maybe, but that is mere speculation from my part. Check if the source material for the advertisment of 1850 and/or the newspaper notice of 1856 is available in e.g. Zucchi’s book (El tango, el bandoneón y sus intérpretes) or in Román’s article cited there.